It’s Reformation Day, and that’s a big deal in my tribe, I’m Lutheran. Today we remember the day that Martin Luther posted his 95 Thesis (topics for debate) on the church doors in Wittenberg 499 years ago. One of the concepts to come out of Reformation is that we are always being reformed, or reshaped, by God’s grace for God’s purposes. This is true corporately and individually. Thinking about that today, I invite to join me In spending some time on how God is reshaping and reforming you, or the congregation you worship with, or your denomination, or The Church as a whole. Prayer: Lord, as difficult as change may be, continue to reform and reshape me for service in your kingdom. Amen. As I read this passage about rough seas, high winds, and God’s sudden presence, I can’t help but think of my friends and family and all the folks along the coast of Florida, Georgia, and South Carolina as they ride out the storm that is Hurricane Matthew. Please join me in praying for them, as well as the people of Haiti who were ravaged by this same storm. Pray that in the midst of of the wind and the waves, that Jesus will show up. I’m confident God will be there in the clean up, helping to put lives and homes back together. Pray for protection for the millions of folks affected by this hurricane. Prayer: Lord, we see the storm, and we are scared. We need you to come to us, like the you did for the disciples when they were in the boat on dangerous seas. We pray especially for the people of Haiti, Florida, Georgia, and South Carolina. Amen. Too Busy to Take a Break? In the bible and in churchy terms, we call it Sabbath time- an invitation to rest. Seems like the older I get, the busier I get, and the less “Sabbath” time I naturally take. Although physically as we age, we seem to need more rest. Study after study after study shows that Sabbath rest is good for our health, our emotional quotient, as well as increased productivity. Today’s scripture verse, the last half of John 6:15 reminds me that Jesus took time away. In the fullness of his humanity he craved it like you and I do; in his wisdom, he took it. Taking even a full day off seems impossible to some of us unless we are on vacation. (And even then it’s hard to completely stay away from work e-mails and phone calls.) If this is a challenge for you, like it is for me, I hope through Jesus’ actions of going away and taking time off in the mountains convicts and invites you to take a time-out from the busyness of life and spend some quality time resting and relaxing. The irony? I live near the mountains and hardly ever get away to them. I am spending some family time next weekend in the mountains and I can’t wait. So if you’re still reading this, I hope you hear like I do, as grace-filled conviction and invitation and challenge to take the “Sabbath” rest time your mind, body, and spirit are so desperately longing for, and then I hope you write it in as an appointment with God on your calendar. 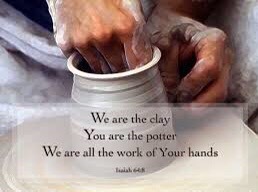 Prayer: Lord, in your wisdom, you designed us not to be consumed by life itself. In your wisdom, you have commanded, invited, and challenged us to take time off, to be with you. Grant us the wisdom and the courage to do it. Blessed. There’s no other way to say it. If you have met my family, you know how blessed I am. I could be in better shape, but I have been blessed with good health so far in life. I may not have Bill Gates kind of money, but I have been blessed with wealth. I have been blessed by my vocation, and being able to provide for my family through it. I have been blessed with amazing friends. The Lord has provided mentors for me all along life’s journey. I have been blessed with the companionship of pets who have been part of our family. I’ve always been blessed with food, shelter, clothing, transportation. I have always had all I’ve ever needed and then some. I’m not just lucky, I’m blessed. I believe God blesses us, not because we are great people, but because, well, God likes to provide. That’s why one of the names we use for The Lord is Providence. After all that The Lord provides for us from the cradle to the grave, how could we ever repay that? What can return to God or offer to The Lord? The One who loves us so much that he would give us Jesus? How do you repay someone for your life? All we have left to give is all that we are – our lives as the offering – knowing, believing, and trusting, that God will then use that offering – us – to provide for someone else. Prayer: Lord, after all that you have done for me, there isn’t anything I won’t do for you. Help me appreciate all you have provided; inspire me again Lord, and use my life to provide for others – just like you did through Jesus. Amen.